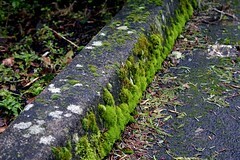 Moss on curbs. It's beautiful, isn't it? Yesterday there were two heavy pallet loads of ancient mossy concrete curbs, straight and curved, dug out and stacked, FOR SALE at Rebuildering Center. Someone had placed a handwritten note on the pile listing a half-dozen cute reusing tips for potential purchasers. Moss creeps me out. It's just so 'mossy'. hey! I was supposed to meet you out at blogging night when Mikey was in town but I injured my shoulder pretty badly. Just wanted to say hello - I finally got my blog up last week but I had to comment 'cuz I LOVE the moss. I took photos yesterday. It's my favorite thing about living in Portland. So fairytale-ish. That's cool. I live in the midwest, what do expect? I'm just thankful that it finally froze again here. I'm so tired of muddy dogs. Are you ready for another mediocore L Word? Hooray for Happy Little Atom. She's one cool cat. Hey does the moss only grow on the North side of the curb? Hmm ponder. Our driveway should be rechristened a mossway. If moss can't grow on a rolling stone then how can it grow on a driveway that has a car rolling up and down it all the time? I do love moss, though. It is just about the prettiest color of green there is. Up here in Seattle, moss is what keeps your lawn looking soooo green. And yet, everyday at work, I'm giving people solutions on how to get rid of it. No appreciation for that gorgeous green color. None. Our insurance co sent us a photo of our house and told us we had to remove the moss (it was there but hardly noticable). How's that for too much moss in SW PDX? I love it and I hate it. We used to have a brick patio but I couldn't keep the moss off and it was waayyy too slippery so we built a deck over it.